John `Kappa` Cornforth was born in Australia, and has been profoundly deaf since his teens. He moved into the field of organic chemistry at Sydney University where he met his wife Rita. Together they moved to Oxford and had a profound influence on the work on penicillin during the war. In 1975 he received the Nobel prize for chemistry for his work on the stereochemistry of enzyme-catalyzed reactions. He is a member of the Royal Society and is still very active in chemistry research at Sussex University. This section from longer archive recordings shows his warmth and personality, and gives an insight into an amazing man who has overcome deafness to pursue a brilliant career in science.
. This interview was recorded in 2002. 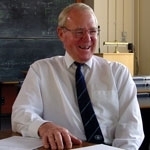 Sir John Cornforth has also recorded one of the Vega "Reflections on Science" series, How to be Right and Wrong, discussing the trials and tribulations of early steroid chemistry research.